A backed up, blocked sink is no fun. A backed up, blocked sink is no fun. 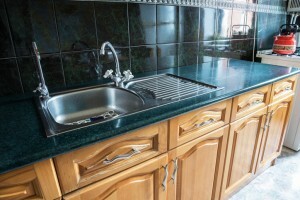 Whether you have just one kitchen sink or multiple ones for different tasks, here’s what you should do when you realize your sink is blocked. First of all, you’ll want to flush the water away. If water stands in your clogged sink for too long, it can quickly become disgusting. You’ve seen the puddles of water outside that have become a hot tub for mosquitoes, right? Don’t let the same thing happen inside your home. The next thing you can try is to use several different cleaners. Which one does the trick? You won’t know unless you attempt to find out. The brands you’ll see on store shelves will do away with whatever is clogging your kitchen sink. Unfortunately, that’s not the only thing they do. They’ll also damage your pipes, which may lead to worse problems down the line. Vinegar is one of your best weapons whenever you need to do some cleaning around the house. So is lemon juice, come to think of it. Baking soda and hot water are also great ideas to try if you’re looking for safer ways to unblock your sink. If all else fails, you might not have any other choice. The toughest clogs call for the most dedicated plumbers. Call on the experts at Master Plumbing to help you determine what the cause of the clog is. However, you aren’t out of options just yet. While it might seem unbelievable, a coat hanger can prove useful. You just need to straighten it out and try to poke into the clog and see if it starts to budge. If that doesn’t work, you can also use what’s called a plumbing auger, a drill-like tool that you can put into your sink’s drain. Spin it a few times and listen to see if the clog breaks up. If it does, then you’re done and that’s all you needed to do! This entry was posted on Friday, June 22nd, 2018 at 8:25 am. Both comments and pings are currently closed.